Scary Monsters magazine #94 - Don Post Mask Tribute! MyMovieMonsters.com > Scary Monsters Magazine > Scary Monsters 1-100 > Scary Monsters magazine #94 - Don Post Mask Tribute! Scary Monsters magazine #94, September 2014. 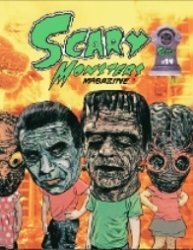 Featuring the legendary Universal Studios Monsters masks from Don Post on the cover! Kaiju Korner Godzilla 2014 Rules! Collectors Note: Stock photo used. Actual magazine has barcode on lower left-hand corner. All ads and contact information (except the website address) related to Scary Monsters Magazine and merchandise are no longer in effect. Please direct all inquiries to scarymonsters@mymoviemonsters.com. Miss the last issue? Click on the handy Add Both to Cart button below!